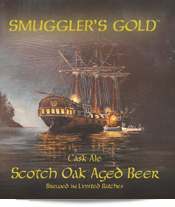 Smugglers Gold Beer is a product extension to our Scotch Whisky, single cask selection of single malt whisky. This English Ale matures in the original oak barrel in which the Scotch Whisky stood for 17yrs. Although the cask is from Scotland the beer is made from the finest English Golding's hops and brewed in Essex. The maturation of beer within the oak barrels adds a defined smoothness of character, not found in any other beers. Each batch of beer is limited like the Single Cask of Smuggler's Gold Whisky. This beer has a warm brown colour; it is smooth with a delicate aroma and occasional hints of vanilla and toffee, distinctive of the whisky from within the cask. The finish is perfect for enjoyment for every occasion, giving a mellow sweetness. Each batch is different having matured for either, 33, 44, 55, 66 or 77 days. After this series of batch maturation the barrel is discarded, having taken the flavous from the barrel. Each batch is limited to approximately 450 bottles equivalent of 500ml each at 5% ABV. These beers are subject to a minimum order of 450 bottles, please mail us for a quotation and transport costs. 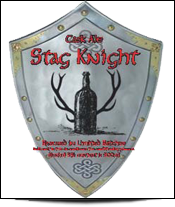 Stag Knight Beer is a premium export beer matured with the finest hops to create a bespoke product that complements our product range of spirits and beers. The beer has been brewed in Essex, England to produce a malt beer that has a light hopping of fruitiness, a complement to any party or celebration. The depth of flavour of the beer can be enjoyed with barbecued juicy steaks or grilled sea food.